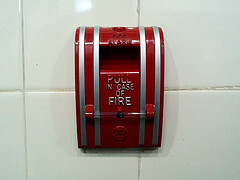 Most of us have, at some point, heard the loud blare of a residential smoke alarm. Hopefully, you will never hear that sound in the face of a serious emergency (Remember: If you ever disable a smoke alarm because of a false warning, reinstall it ASAP!!). Sadly, however, residential fires are a very real danger and it is often smoke inhalation rather than the flames that pose the greatest danger. When dangerous fires are the result of human negligence — including shoddy construction, the failure of a landlord to provide appropriate safety equipment, a faulty consumer product, or any other negligent act that causes or exacerbates a fire – our San Francisco fire injury lawyer is here to help. As CBS SF reported, a large fire broke out in San Francisco’s Mission D istrict last weekend. The fire started sometime around 2:30 PM on Saturday and eventually raged to five-alarms as it spread to multiple buildings on the 3300 block of Mission Street. By the time firefighters contained the blaze three hours later, it had burned six buildings and left 58 people displaced from their homes. CBS reports that at least two people were treated at an area hospital for smoke inhalation and officials treated a 1-year-old child for breathing issues on the scene. Parts of the area remained closed to traffic on Monday as fire officials continued to investigate the cause of the blaze. According to WebMD, smoke inhalation, not burns, is responsible for 70% of fire deaths. Smoke includes both heated particles and gases, with the exact composition varying from fire to fire based on the fire’s temperature, the products burned, and the amount of oxygen available to the blaze. Smoke inhalation damages the body in several different ways including simple asphyxiation (i.e. lack of necessary oxygen due to the fire consuming available oxygen or oxygen being replaced by other substances), chemical asphyxiation, irritation from chemicals/heat, or a combination of these factors. Anyone who has suffered smoke inhalation should receive an evaluation from a medical professional. A doctor, nurse, or other emergency service professional should check the airways, breathing, and circulation (“ABCs”) of anyone exposed to smoke. Signs and symptoms of smoke inhalation can be varied and may include a persistent cough, hoarse voice, irritated eyes, shortness of breath, headache, and/or changes to mental status (e.g., confusion or fainting). A person suffering from smoke inhalation may deteriorate very rapidly and it is highly advisable for the patient to be transported via emergency medical services rather than a private vehicle because of the danger of problems in route. We can all help prevent fire and smoke injuries/deaths by making sure there are working smoke detectors in every room of occupied buildings, particularly bedrooms. Additionally, officials advise creating and practicing an escape plan, including creating an established meeting place for people to gather after escaping a fire. If a fire does occur, it is better to wait for emergency officials to rescue a trapped individual (or pet) rather than endanger yourself attempting to help. Sometimes a fire is a true accident. Often, however, a fire is the result of the negligence of an individual or an organization. For example, a fire may result from shoddy electrical work, a dangerously defective product, or the failure of an owner/landlord to follow safety regulations. With offices of our fire injury and fire death law firm in San Francisco, Oakland, and Santa Rosa, we help people left injured and/or grieving after a fire recover compensation from those at fault. Call for a free consultation.